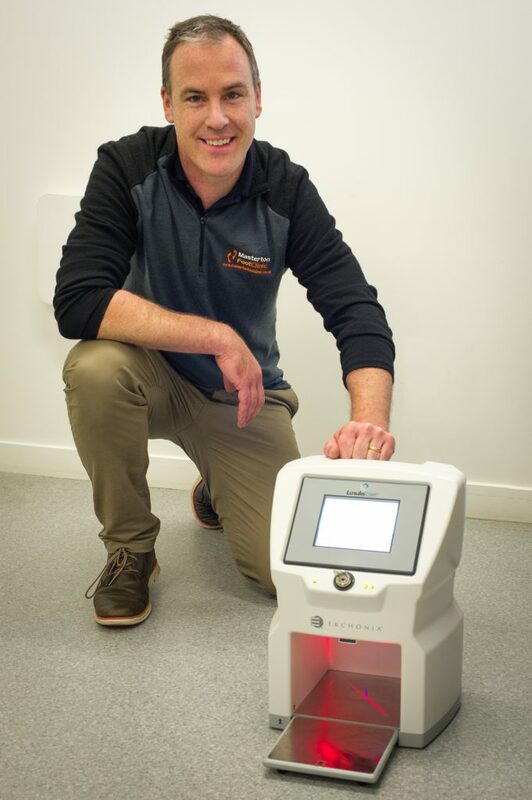 Since 1996, Erchonia, the manufacturer of Lunula, has been committed to fully elucidating the medical utility of low-level laser therapy through rigorous clinical studies. 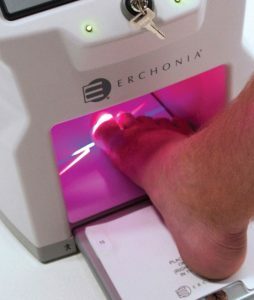 For over a decade, Erchonia has studied the clinical utility of low-level laser devices for the treatment of numerous medical ailments, and their recent device, Lunula, looks to revolutionise the way clear and healthy nails are restored following infection by fungus..
Lunula has been markedly studied – from the early in-vitro analysis to the extensive in-vivo studies – and its clinical utility to enable unsightly toenails to grow clear and healthy has been substantiated. The unique dual-diode approach of Lunula fortifies the body’s natural defense mechanisms against any infectious agent, and accelerates the growth of the nail. This multifaceted approach is the first of its kind, providing a truly effective, yet safe, way to enable the growth of strong, clear and healthy nails even when they may have previously been infected with fungal spores. As you will quickly learn, Lunula is supported by an unwavering clinical foundation of both histological and clinical evidence that upholds the viability of this approach and ensures an effective procedure. DID YOU KNOW?Lunula has been studied both in-vitro and in-vivo. Lunula’s effectiveness at growing clear and healthy nails has been substantiated by three independent clinical investigations. It is important to mention that no topical/oral antifungals were administered during the studies. The first study evaluated 168 toes with an average baseline affected nail involvement of 81.15%. After a single Lunula application, affected nail involvement was reduced to 31.32% at study endpoint, an improvement in nail clarity of 63.58%. The second study, evaluated 105 toes, or 75 subjects, after two Lunula applications separated by a single week. Subjects reported an average clear nail of 73.79% and 79.75% at post-procedure months 3 and 6, respectively. This was a statistically significant change compared with the average 43.4% clear nail measured at baseline. The third study consisted of 109 patients (139 toes) subject to laser irradiation at 405nm and 635nm for twelve minutes at weekly intervals for four weeks. The interim results from this Lunula Laser study show extremely high levels of efficacy over 48 weeks. Equally important, the responses observed in all three trials were achieved without a single adverse event. DID YOU KNOW? More than 10% of the general population has onychomycosis. ORAL MEDICATIONS. The limitations and risks of oral antifungal medications have been well documented. First, treatment of the body’s most distal region – the toes – with an oral antifungal medication is often greeted with non-response or high rate of recurrence due to limited drug bioavailability routinely caused by insufficient blood flow. Next, the infectious agent is a eukaryote, and therefore, shares structural and biochemical similarities with our body’s eukaryotic cell. As a result, our own important biochemical pathways can be negatively affected by oral antifungals. Although quite rare, hepatotoxicity has been reported in patients taking oral antifungal medication. To mitigate the risk of liver complications, patients with specific pre-existing medical conditions cannot be prescribed oral antifungal medications, but for those patients who are taking antifungals they must undergo routine liver function tests throughout the treatment course. Non-response, high-rate of recurrence, limited to certain patients, and serious risk of adverse events – these represent the drawback of oral antifungal medications. In addition to the serious side effects, the results are not impressive. Below is a chart that details reported results for common oral therapies. *Patients must undergo liver function tests at baseline and weeks 4 or 6 to ensure there are no complications. DID YOU KNOW? Patients in a 168-toe study reported a 73.89% improvement in nail clarity in 3.5 months. Lunula combines two beneficial low level laser wavelengths: 405nm and 635nm. Each wavelength is capable of stimulating a specific cascade to help the body grow strong, clear and healthy nails. Both wavelengths are enriched by a proprietary, rotating line-generated beam; a unique delivery mechanism that maximises photon concentration and application surface area— ensuring that all toes received adequate stimulation. As a result, the Lunula provides a completely safe procedure absent of any adverse events while inducing key pathways to effectively address unsightly nails. The 635nm wavelength stimulates Cytochrome C Oxidsase (CCO), an important enzyme necessary for the production of Adenosine Triphosphate (ATP) and Reactive Oxygen Species (ROS). Increased ATP activates PI3 kinase/eNOS signaling pathways, which increases Nitric Oxide (NO) production. NO is critical for new blood vessel formation increasing nutrient delivery and infiltration of immunological cells. For resident macrophages and neutrophils, two types of immune cells, the increased production of ROS is quickly converted into cytotoxic hydrogen peroxide (H2O2), which enhances the performance of the immune cells. Zheng H et al (1992) Activation of immune cells (macrophage) by increasing concentration of ROS with laser. 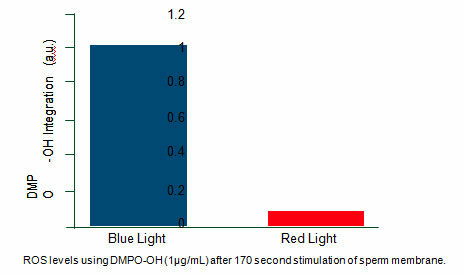 Dolgushin et al (2010) Stimulation of neutrophil function by increasing ROS production following laser. Schindl et al (1999) Activation PI3 kinase/eNOS signaling following 632.8 nm laser. MacMicking et (al(1997) Nitric oxide (NO) reveals antimicrobial effects against infectious agents. Gasparyan et al (2006) Laser at 632.8 nm increases new blood vessel formation (angiogenesis). Emmons et al (1939) Fungal damage reported following stimulation with near-UV. light (~405 nm). 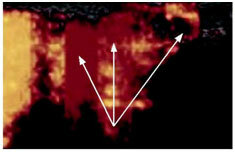 Klebanov et al (2005) Membrane degradation reported as a result of increased ROS levels following laser at ~405 nm. Eichler M et al (2005) Increased ROS production following stimulation of NOX receptor with ~405 nm laser. Lavi R et al (2012) Increased level of ROS following stimulation with ~405 nm. When applied concurrently, the two wavelengths represent a truly multifaceted procedure. FIRST – By increasing fungal spore susceptibility to the body’s immune response. ▪ SECOND – By fortifying the body’s endogenous immune system. The application of 405 nm has been reported to significantly increase the production of ROS and activate key secondary cascades. When compared to other wavelengths, 405 nm yields the highest production of ROS (Figure 1). Peripheral blood flow impairment can affect the body’s endogenous immune response to any infectious agent. Without the infiltration of leukocytes, monocytes, and macrophage, the infectious agent is able to spread along the nail plate and bed. The 635nm wavelength has been proven to increase peripheral blood by stimulating key pathways responsible for angiogenesis (new blood vessel formation). Increased blood flow provides greater nutrient delivery to tissues for rejuvenation, accelerating nail growth and enabling a more effective immune response. 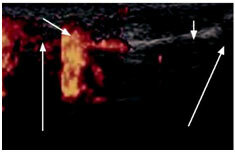 The images below demonstrate the improved blood flow benefit of the 635nm wavelength.